Wash and cook masoor dal in presser cooker. Meanwhile make masala for the dal. Grind 1 tomato,cumin powder, green chilies, haldi to smooth paste. Once the dal is cooked mash it with spatula and add the masala paste. Also add chopped tomato, salt, chili powder and 1 cup water. Cook further till tomato pieces are soft. Now add chopped cilantro and mix well. Make tempering adding mustard, cumin, udad da,. curry leaves and red chili to oil. 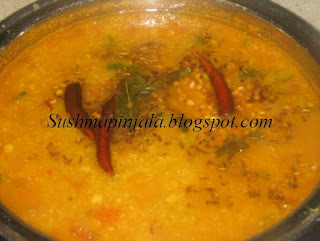 Add the tempering to cooked dal and serve hot with rice or roti. Check to see what my fellow bloggers are cooking for BM # 20. Cook toor dal and mash it. Add 2 cups water to cooked dal. Also add sliced onions, green chili, salt, haldi and chili powder. Crush garlic and cumin together and add to dal. Now cook further till dal becomes half of it. Do not too thick this dal/ kattu has to be watery. Finally add chopped cilantro and mix. 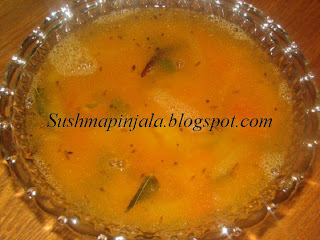 Now make tempering adding cumin, red chili, udad dal, mustard and curry leaves to oil. Add this tempering to dal and serve hot with rice. Check to see what my fellow bloggers are cooking for Blogging Marathon 20. In a presser cooker add washed dal, chopped, spinach, onion, tomato, cilantro, green chilies, 2 garlic cloves, haldi and enough water to cook. Once done remove and mash the dal with spatula. Add salt and little water to cook further. 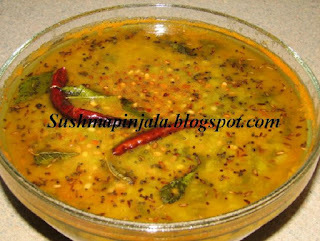 Dal should not be too thick or too watery. Now make tempering adding mustard seeds, cumin, red chili, curry leaves, and crushed garlic to oil. Add this to dal and transfer to serving bowl. Serve hot with roti, rice or naan. Melt butter and add to maida. Now add water to make stiff dough. Now make very small balls from the maida dough. Take a fork and place on the plate or on kitchen platform. 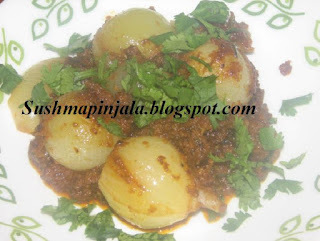 Take a ball of maida and press along the fork to make as shells. You can see the fork marks on the shells now. Deep fry these shells till golden brown. In another pan add sugar and 1/3 cup of water. Once you see bubbles in the syrup add the fried shells and rest them for 15 minutes. Sweet shells are ready to serve. Soak rice and chana dal separately for 30minutes. Drain water and grind the rice to course powder. In apan heat 2 spoons oil or ghee and add chana dal. Also add rice powder and mix well. Add salt and water. Cook till done. 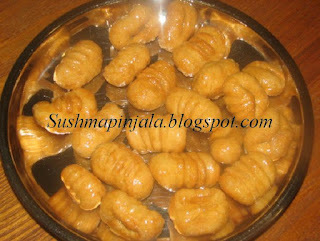 Let it cool for few minutes and make them to small balls. Heat pan and add ghee add cashew nuts and Sauté till cashew turn slight brown. Now add raisins and sauté till they puff up. Transfer to any bowl and add Sooji into the pan, sauté for 2 minutes and add coconut powder. Now cook till light brown color. Switch off flame and add sugar. Also add elachi powder and mix well. Add cashew and raisins to this mix. 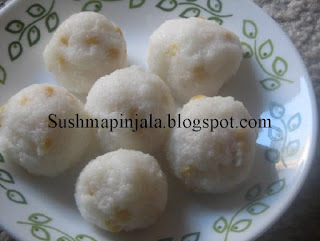 Now slowly add very little milk to the rava to make ladoo. Do not add all the milk at a time. 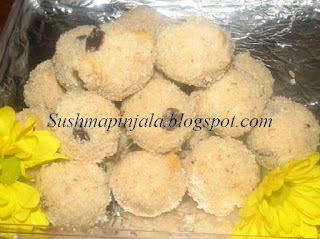 Make ladoos when the mixture is hot. Can be stored till 10 days in a air tight container. In a bowl mix corn flour, maida, salt, pepper powder and soda. 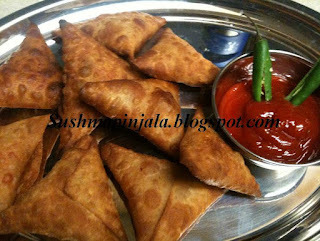 Add water to make smooth batter as you make for any bajji. Cut onions into rounds and separate each of them. Heat oil for deep frying. Once the oil is ready for frying, dip each onion ring into the batter and deep fry till crisp or golden brown. 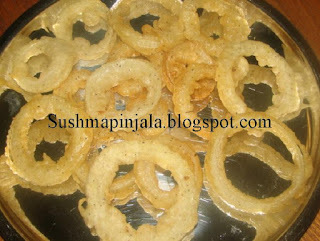 Sprinkle little chat masala on the fried onion rings and serve hot. Check to see what my fellow bloggers are cooking for Blogging Marathon # 20.